Boasting elegance and authentic colonial brilliance, Hacienda Jurica by Brisas is a luxury historic destination in Queretaro, Mexico affording impeccable service, opulent furnishings, and restful accommodations. Surrounded by resplendent landscape, the hotel boasts lush gardens, stunning terraces, and nearby healing thermal waters. 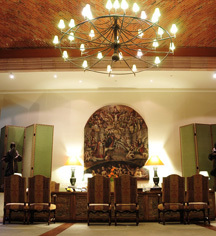 A 16th century hacienda, this imposing estate exemplifies historic significance and the cultural crossroads of the region. Carefully preserving its dramatic architecture, Hacienda Jurica by Brisas highlights its heritage and structural integrity throughout the property. From traditional Mexican cuisine to expressive furnishings, this Spanish Colonial property lends an Old World feel without sacrificing the convenience of modern amenities. With its exquisite service, manicured grounds, and extravagant facilities, Hacienda Jurica by Brisas boasts the ideal destination for luxury travel. 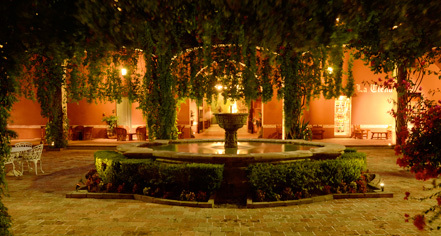 Hacienda Jurica by Brisas is located in Querétaro, Mexico, with the Querétaro Intercontinental Airport approximately 45 minutes away. The Presidential Suite living room was once the site dedicated to conduct Catholic mass by the village priest. Boasting elegance and authentic colonial brilliance, Hacienda Jurica by Brisas is a luxury historic destination in Queretaro, Mexico affording impeccable service, opulent furnishings, and restful accommodations. Surrounded by resplendent landscape, the hotel boasts lush gardens, stunning terraces, and nearby healing thermal waters. Learn more about the History of Hacienda Jurica by Brisas .